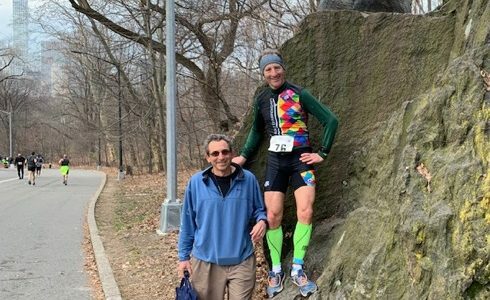 Doug Landau actually wore a matching kit (from the World Championships in Penticton) for the NYC March Class Duathlon. His high school track teammate and fellow lawyer Hank Kimmel was up visiting from Atlanta, GA. Kimmel was impressed by Landau’s speedy transitions, rather than his pedestrian running pace. They are posing under what may be a bearcat, which is the mascot for The Hotchkiss School, where they met in 1977. 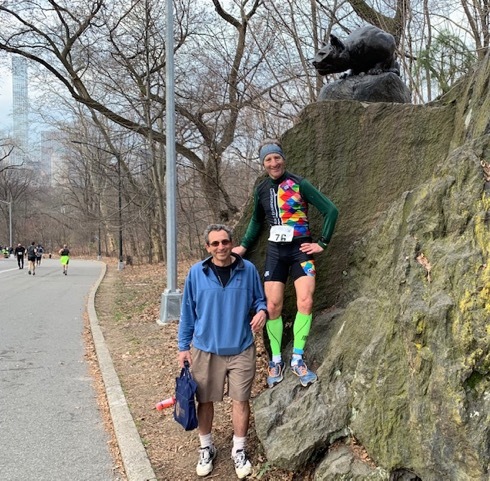 In his first multisport competition of 2019, attorney Doug Landau was an Age Group prize winner at the Central Park Duathlon in New York City. podium. This year was different in that lawyer Landau won his division by more than a mile, mostly because of a strong bike leg during which no other racers were able to successfully pass him. The Landau family was in the Big Apple for a family event. As per his M.O., Landau visited with an airport injury client outside of Newark (NJ) International Airport while picking up his eldest daughter and her husband. He then stayed in New Jersey with his mother, celebrated with the family in the City, and then dropped off folks at the airport on the way back to Virginia. 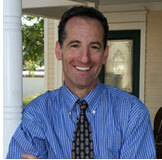 It was another instance of “Faces, Places, Cases and Races” for lawyer Landau. He will try to get a few more outdoor rides and runs in before leaving for Greenville, South Carolina, for the 2019 Duathlon National Championships. In addition, while he’s there, he will visit with new and old clients to discuss their cases, meet with former Abrams Landau associate Lisa Beaman, see new places and faces of old friends, and watch the other races preceding his event. To see when Landau is racing near you, please look at the latest Abrams Landau law firm e-newsletter here.